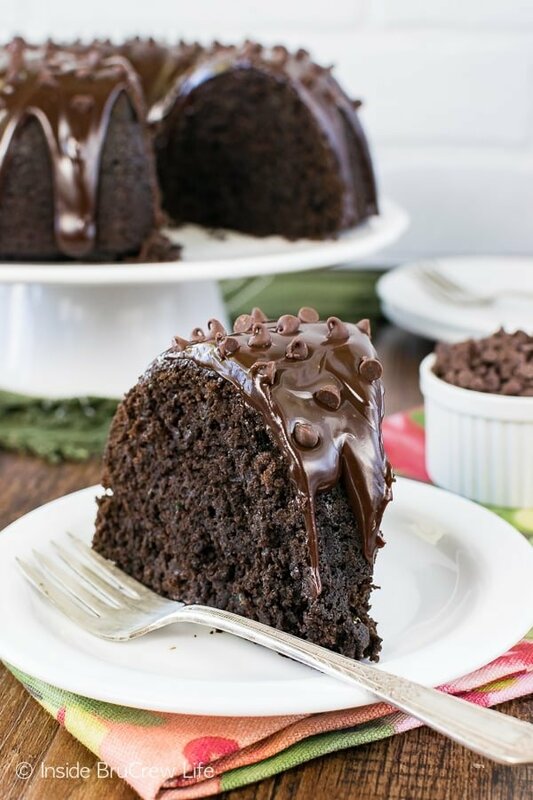 Three times the chocolate makes this Ultimate Chocolate Zucchini Bundt Cake a decadent and fun way to eat your greens. 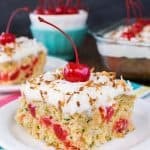 It’s such a great summer dessert! Do you get excited for certain ingredients at certain times of the year? I know right now we are quickly headed toward fall, and everyone is getting ready for pumpkin and apple all day long. I’ll admit that I’ve already stocked up on a few cans of pumpkin because I’m ready to do some pumpkin baking very soon. But during the later summer months, I get excited for a different veggie to use in my baking. I know I should enjoy zucchini as a veggie more often, but I seriously love baking it into my chocolate goods. It gives them such an awesome texture and taste! 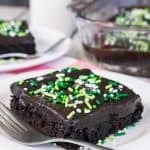 This dark chocolate zucchini cake and this dark chocolate zucchini bread were two of my favorite ways to “eat my greens”. I say they were my favorite because this decadent cake staring back at you jumped into the number one zucchini recipe spot. For now anyway. I reserve the right to change my mind as soon as I bake another chocolate zucchini dessert because that’s just what I do. A few weeks ago I headed to the grocery store because I was craving more chocolate covered zucchini. Since my bundt pan has been feeling neglected, I decided to use the veggie to make an over the top chocolate cake. 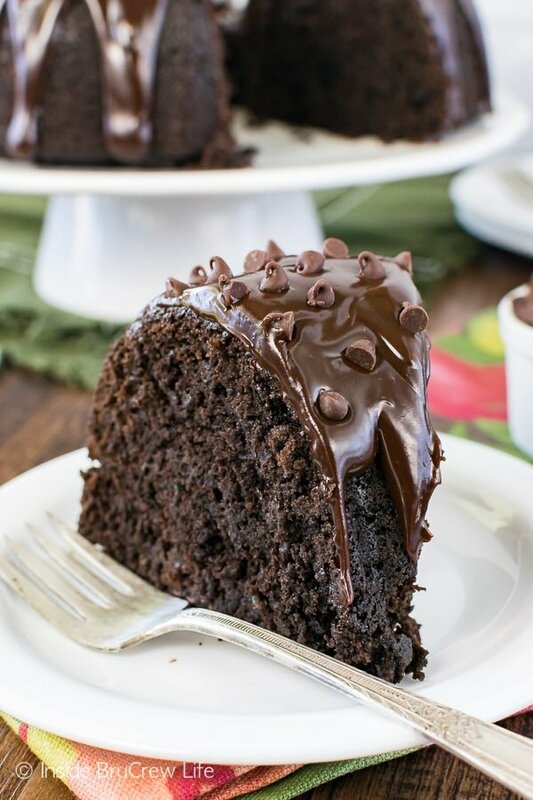 Using thee kinds of chocolate made this the most decadent, most amazing, and most delicious cake ever. You can see why I had to call it the ultimate, right? Dark chocolate cocoa powder in the batter gives it the dark rich color. 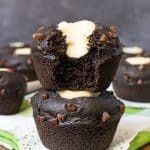 Mini chocolate chips in the batter and on top add little pockets of chocolate goodness inside and out. 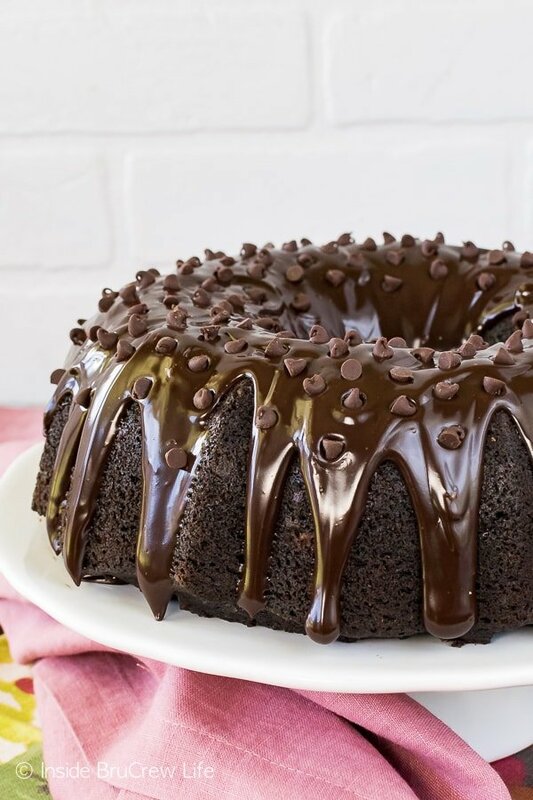 And then the chocolate glaze rolling over the sides of the cake will have you swooning. Spooning that chocolate over the top was difficult because all I wanted to do was pour it into my mouth. 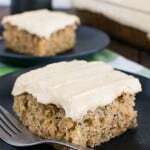 The three cups of shredded zucchini inside the cake gives you a good reason to call this dessert a veggie. A slice of this cake can totally count as part of your daily greens. Wink, wink! Yes, I realize my logic on greens and chocolate is slightly skewed. It’s why my shorts and I have an epic battle every summer. But we will have to continue fighting because I’m not giving up my chocolate covered zucchini any time soon. 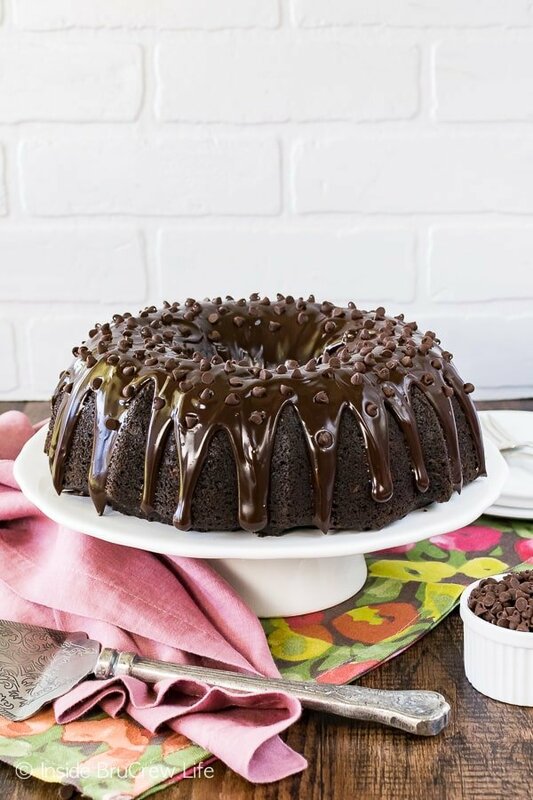 So, would you be able to resist this ultimate chocolate zucchini bundt cake if it was sitting on your counter? I sure didn’t. 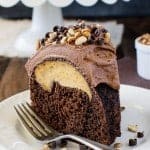 Three times the chocolate makes this Ultimate Chocolate Zucchini Bundt Cake a decadent and fun way to eat your greens. Great summer dessert! Stir together the flour, cocoa powder, baking powder, baking soda, salt, cinnamon, and nutmeg. Add the dry alternately with the buttermilk until everything is incorporated. Stir in the zucchini and chocolate chips by hand. Pour into the prepared pan. Bake for 50-60 minutes, or until a toothpick or knife inserted into the center of the cake comes out mostly clean. Remove and cool in the pan for 15 minutes, then flip it out onto a plate and cool completely. Place the chocolate chips and heavy cream in a microwave safe bowl. Heat for 30 seconds. Stir until melted and creamy. Let it cool 5-10 minutes, then spoon over the top of the cake. Sprinkle with the mini chips and let set. Store in a tightly sealed container. *If you do not have buttermilk on hand, pour 1 1/2 teaspoons lemon juice in a measuring cup, then add milk until it reaches the 1/2 cup mark. Let it sit 5-10 minutes before using. More fun recipes so you can use up those extra zucchinis from the garden. 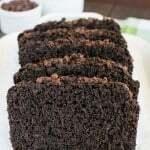 OHMYGOSH; that looks so delicious and looks nice and moist as well. Chocolate . . . A Delicious Cure for a Bad Day. The cake has several steps but recipe actually quite easy to follow.i don’t have allot of patience so if I can follow recipe anyone.can.i made this for dessert to take along with dinner for my brother.my husband and I were going to his house to have an enjoyable evening with him.